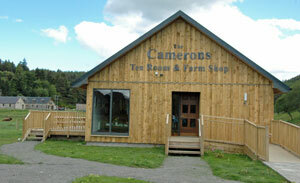 The Camerons Tea Room & Farm Shop is now open for business on Glenlia Farm in the village of Foyers in the Highlands of Scotland. It is situated a short stroll away from Camerons Holiday Cottage between Inverness and Fort Augustus on the peaceful South side of Loch Ness. 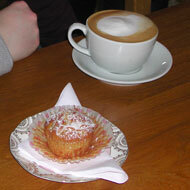 Perfectly situated for refreshments while staying in the holiday cottage. It is only a quarter of a mile from the famous Falls of Foyers waterfall. 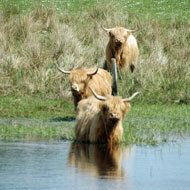 Look out for the sign to Camerons Holiday Cottage, Camerons Tea Room and the highland cattle in the fields. You can always expect a warm and friendly welcome from Morag Cameron, who is a joint owner along with her husband Ali Cameron. 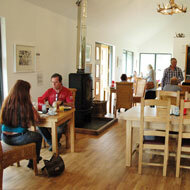 Morag and her friendly staff are only too pleased to assist the customers and stop to have a chat. The open plan area is bright and spacious with natural light coming through the numerous large windows and glass pannelled decking doors. 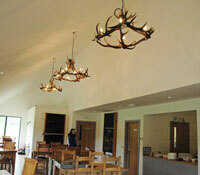 Extra lighting is provided from the three specially commissioned chandeliers made from Red Deer Stag antlers. Open from 9 to 4 daily ......7 days a week. November 1 to April 1. Winter opening hours. XMAS OPENING-only closed Xmas day-boxing day-new years day. On a fair day the spacious outside decking is available for seating. From here you can really relax and look out at the wonderful scenery and also at the magnificent pedigree herd of Highland Cattle who often come to cool down in the large natural pond nearby. Great photo opportunity to see these wonderful beasts so close. 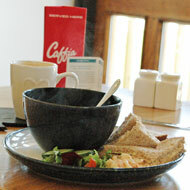 A wide range of home baking and a soup of the day is freshly prepared daily. A selection of various coffees....Espresso,Cappuccino.Caffe Latte,Americano. Various teas and hot chocolate available. 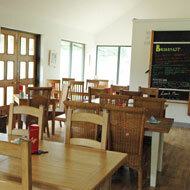 Choose from the various sample menus written on the attractive roll over school blackboard. 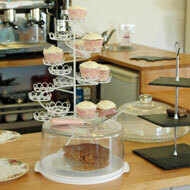 Various home baked cakes, scones, traybakes, muffins, cupcakes, cream tea, delicious sponges all freshly prepared daily. Spacious seating area. 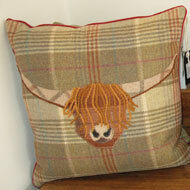 Pedigree Highland Cattle. 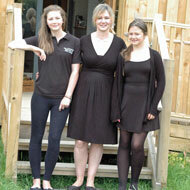 Morag with daughters Verity & Ishy. 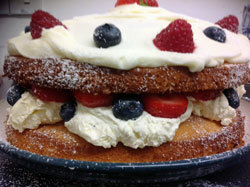 Reason to celebrate - then celebrate at Camerons with a special tea and a home baked cake of your choice. 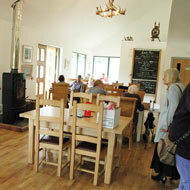 Could be for a BIRTHDAY, ANNIVERSARY or just a get together with family & friends. Just phone Morag on 01456 486572 for further information and to book your party. 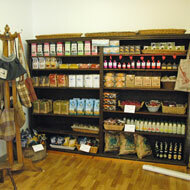 The Farm Shop offers fresh seasonal produce as well as local crafts,cards and gifts. Paintings and prints on the walls by local artists are for sale. 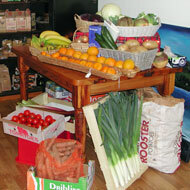 Chilled cabinets will be arriving soon for cold produce. Ice cream freezer in situ.